Olympics organisers have come under attack from environmentalists, artists, indigenous people’s leaders and development groups over the position of BP as an official partner in the games. There has been subvertising and everything! Every time I see one of those adverts, I think “that is so wrong”. Jessica Ennis running through the sands – fuelled not by BP but by her breakfast. But what’s that scary green bubble following her like the white ball in The Prisoner? Just BP reminding us that there’s nothing like an oil company to mess up a good beach. 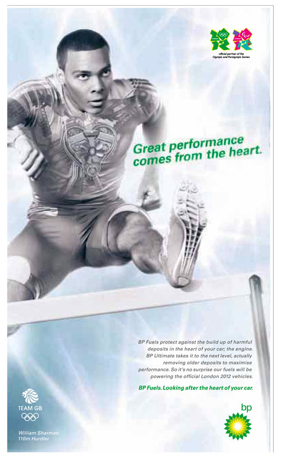 And if that’s not bad enough, in this ad the hurdler doesn’t just need a BP powered Olympic car – he actually is the car! He has an engine for a heart and BP oil in his veins. Fantastic. This entry was posted in bad games and tagged advertising, BP, environment, Olympic sponsors by Eileen Kennedy. Bookmark the permalink.